The Volunteer program consists of members from the community who have demonstrated a willingness to maintain a high quality of life in the area they live in. These individuals have assumed responsibilities that require them to achieve a higher level of public trust. Volunteers have an opportunity to learn about law enforcement, and with their unselfish acts of community service, help improve law enforcement services. Volunteers On Patrol - Volunteers work in volunteer vehicles in a volunteer uniform assisting in the field as additional eyes and ears in the community. Mounted Volunteers - Volunteers that work alongside Posse Reserve Deputies who have ongoing training with their horse to provide safe and effective mounted observation patrol. Sheriff's Explorer Program - Our Sheriff's Explorer Program has created a volunteer partnership between youths in our community and law enforcement. The explorers, between 16 and 20 years of age, receive extensive training in an academy setting. They then participate in community affairs and non-hazardous law enforcement activities. Search and Rescue Volunteers - Volunteers that work alongside Search and Rescue Reserve Deputies, which are highly trained and were formed to function as the Sheriff Department's official emergency response unit, providing services to residents who become stranded, lost, or injured in the mountainous areas of the Antelope Valley. CERT Certified Volunteers- Volunteers who elect to respond to disaster areas and provide aid as directed by the Sheriff's Department. 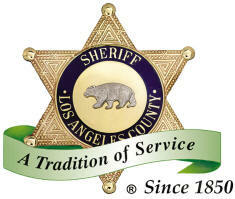 DCS - A volunteer organization, administered by the Sheriff's Department Emergency Operations Bureau, that provides disaster relief communication for the citizens of Los Angeles County. Clergy Program - Clergy members in the community who ride with the deputies and assist in dealing with human crisis. Front Desk - Volunteers work the station front counter in a Volunteer Uniform to greet the public and provide station services. Clerical - Volunteers work in the station secretariat and assist with filing of reports and work under the direction of the secretaries.